1. Trolling for trout without a down-rigger? Trolling flat-lines on Lake Coleridge. You certainly don’t need a down-rigger on your boat to catch fish. Trolling for trout with nothing on your line other than your lure is called flat-lining in the United States. 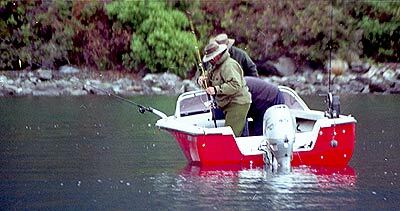 A down-rigger is an additional fishing tool like any other but it won’t guarantee you catch fish. In certain situations, a down-rigger can make a big difference to your catch rate. In general on fine clear days with the sun high in a cloudless blue sky and the lake flat calm, the fish are often a bit deeper. Cannon downrigger and Mercury Outboard at Lake Coleridge. 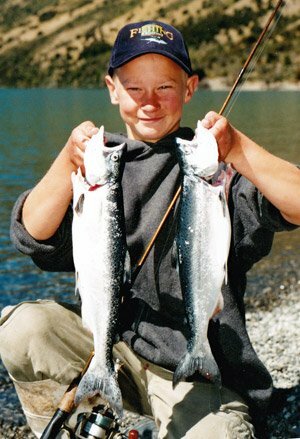 My two sons and I regularly troll together for landlocked salmon and trout on Lake Coleridge We always run one lure deep on the down-rigger and another two straight out the back on light mono. We have found that on Lake Coleridge in mid-winter the fish almost always take the deep runner trolled at a depth of around 40 feet. Having our Scotty down-rigger gives us another option. One that is definitely worthwhile having when the fish are slow biting. At least you know you are doing all that is possible to catch a fish! Flat-lining tends to be more effective when there is a bit of chop on the water. It also helps if it is raining! See also Lake Coleridge Group. 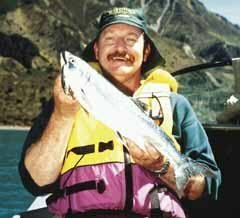 The author with a landlocked salmon from Lake Coleridge taken trolling with the aid of a downrigger. 2. Lead Line Trolling or Harling? We used to troll lead line quite a bit in the early days. There are two main disadvantages with lead lines. Firstly if a small fish strikes your feathered lure you quite often don’t even notice it because you are trolling so much weight anyway. This is bad news for the fish which might well be dead by the time you wind in your line to check it. This, of course, makes it harder to let the little ones go. Secondly, when you do get a strike on lead line the fish can’t fight at it’s best because it has to drag all that line around. Whereas with a down-rigger you can still fish deep with light mono because the line pops out of the down-rigger clip when a fish strikes enabling you to play it directly on light line. I’ve also found a bibbed minnow like a Rapala Tail Dancer gets down over 3 meters anyway. This is about the same depth as a leadline. Jensen Crank Bait measuring length 8cm excluding bib is an excellent trout and salmon taker. These bibbed minnows though more expensive than other lures they are seldom lost while lake trolling. 3. What sort of lures do you use? 4. How do you get to some of the secluded spots around Lake Coleridge? At Lake Coleridge, you can launch at Boat Harbour, Ryton Bay and at the Harper Diversion. We have always launched at the Harper end or head of the lake. I know I’ve said it before, but I’m going to say it again. Boaties must treat Lake Coleridge with great respect. This lake can cut up rough very quickly. It pays particularly for a smaller craft to stay close to the edges. The best fishing is always within 100 meters of the shore anyway. Keep an eye on the weather constantly. If you are way down the lake in a small boat on the western side, past O’Rorkes Fan, and a howling nor’west starts blowing don’t attempt to cross over to Ryton Bay. Indeed if you do get caught it is better to go ashore and stay there. The wind can howl down the lake creating big swells and broken water where 20 minutes earlier it had been flat calm. Usually, it is best to get out on Lake Coleridge early morning before the wind comes up around midday. Landlocked salmon taken trolling on a Jensen Crank Bait while trolling in Lake Coleridge. 5. What weight of line do you use? All my lake reels are spooled with 6 lb mono. This is heavy enough to land the heaviest trout in a lake both from shore or boat. Light 6 lb line also enables your lures to “swim” at their best through the water. I wouldn’t go any lighter. There is no need. You would only get more “bust-offs” from incorrectly tied knots or even slight line damage. You are best to stick with the 6 lb. I have a quarter pound bulk spool of 6 lb Daiwa Crystal Clear monofilament that has lasted me for years. The line on this spool was 2.319 kilometres long! This is enough to re-spool my reels about 20 times. 6. What rod and reel do you use? Fishing tackle today is much less expensive than in the past. You can get a top quality combo for around $200. For trolling I fish with light spinning gear. If you are going to fish 6lb line than that will be your starting point for rod and reel selection. For trolling one of my favourite outfits is a 7 foot Daiwa Heartland-S medium action rod, partnered with a Shimano AeroCast 4010 reel which holds around 250 meters on the spool. The advantage of this outfit is that it performs a dual role being ideal for trolling, as well as casting from lakeshore or riverbank. 7. What is the best time of day for lake trolling? That’s an easy question to answer. The best time of day is the period between first light and sun up. It is a good idea to start trolling the lake on the side the sun will hit first. Then when the sun hits the water crossover and fish the shaded side before it too is in full sunlight. 8. Does it matter where you put your rod holders on a boat? Yes, it does! For trolling you want to get as wide a spread between rod tips as possible to avoid tangles. Stabi-Craft 430 set up for trolling with Scotty electric downrigger. Note the rod tips oppose one another for maximum lure spread to avoid tangles. 9. Where is the best place for trolling for trout: in close, out deep, or a mixture? The best lake fishing will almost always be in water that is less than 20 meters deep. I have tried deep trolling below this mark but although the fish are clearly showing on the sounder they don’t seem to take the lure. In Coleridge where the lakeshore shelves steeply out to a depth of 200 meters, it is best to troll parallel to shore following the lake bed contour with the aid of your sounder. Stay within a depth of 20 meters or less. When you get a strike continue trolling at that depth. In shallow water, at around five meters you will get strikes without the fish showing on the sounder. At this depth, I find it is best to get plenty of line out (70 meters or more). Fish will move out from under your hull in the shallower water. A longer line means they are more likely to see your lure after you have passed by. The best depth to troll will also depend on weather conditions and time of day. Generally the calmer the lake, and brighter the weather, the deeper the fish. We have made some of our best catches at the Lake Coleridge High Country Opening Weekend in water less than 5 meters deep without the aid of a down-rigger. The wind was blowing, the sky was overcast and very gloomy. It was also raining steadily. These are poor conditions for fishermen but great conditions for fishing. At times like these fish are more likely to be feed near the surface close to shore. 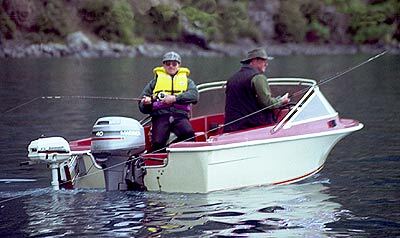 These anglers on Lake Coleridge have a downrigger attached to the stern on the starboard side. Note the cannonball in front of the transom. 10. What time of year is most successful? I well remember a mid-winter trip to the Ahuriri Arm of Lake Bemore at the invitation of the Woolston Working Men’s Club Fishing Section. They hold an annual fishing competition there against members of the Canterbury Anglers Club. Together these guys have an enormous wealth of collective fishing knowledge accumulated over many lifetimes. The lake was full of fat rainbows but without their knowledge, it would have been difficult to catch them! During winter the rainbows cruise the shallows near the mouth of the Ahuriri River. At this end of the lake, the water is sparkling clear whereas the remainder of the lake is milky. This discolouration is caused by suspended glacial silt. 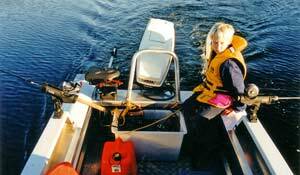 The tried and tested fishing method was to run the boat into the water only a meter or so deep and then switch off and cast from the drifting Stabi-Craft 490. After about fifteen minutes the light breeze would eventually blow us back out into the deeper, milky water. At which time we’d start the motor and run back up and repeat the drift. Each time as we came back up into the clear shallow water rainbow trout would scoot out of the way as if allowing us to pass. In such clear water, we could see them darting over the weed-beds. Each time I switched off the motor the four of us would start casting. Almost immediately one of us would be into a fish. Often before I could get my rod out of the holder! The moral of this story is that local knowledge is essential for all types of fishing. If we had simply arrived at Lake Benmore and started trolling as we would have on Lake Coleridge we would probably have caught nothing all day. During the summer months at Lake Benmore, a different strategy would be required. A brace of typical Lake Coleridge landlocked salmon.